So in anticipation of next year's Godzilla from Legendary Pictures and Gareth Edwards I've decided to engage in a year-long marathon of Godzilla and related kaiju films. The first up, obviously, is the original 1954 classic, which although a bit outdated in some ways, continues to stand the test of time. One of the things that's interesting about Gojira is how dry it is compared to many of the later Godzilla films. It's not just a matter of being serious vs. campy, because the 1954 film is distinct even from later serious films like The Return of Godzilla or Godzilla vs. Destoroyah in its approach. 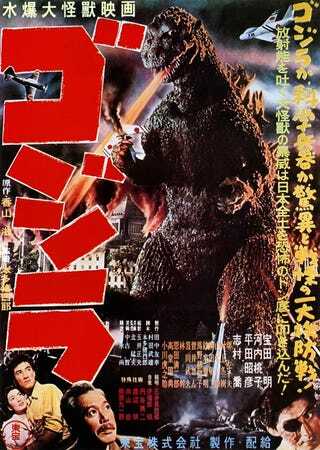 Compared with later Godzilla films, Gojira has an almost documentary-like approach, describing an unfolding tragedy as a series of related events and less as a traditional story with a central protagonist. It's hard to say who is the central character of Gojira: Yamane and Serizawa are both fairly important, but without Emiko to connect them their stories are more or less unrelated. This is even more striking if you're familiar with the American dub of the film, which puts Raymond Burr's Steve Martin at front and center as the American witness to everything that happens. That isn't to say that the original approach isn't a bad one; if anything it makes the film seem all the more real, particularly given the intentional parallels between Godzilla's attack and the nuclear devastation wrought at Hiroshima and Nagasaki. The still-convincing special effects, as directed by the legendary Eiji Tsuburaya, help in this regard, as does the classic soundtrack by Akira Ifukube. Taken as a whole, Gojira is a film that remains a classic, though in some ways it may seem a bit obtuse and outdated by our modern storytelling conventions. It certainly isn't the fun-filled destructive romp that many later Godzilla films are, but given that it's primarily a commentary on Japan's post-war anxieties during the tension-filled 1950s, that's hardly a surprise.